New York: Henry Holt & Company, 2013. Book. As New. Hardcover. 1st Edition. First Edition/First Printing. Hardcover in unclipped dustjacket. 896 pages with photographs and maps. The stirring final volume in the Liberation Trilogy. Absolutely monumental and moving. A fine dustjacket over a fine book. As New. Unread. From my smoke-free collection. Ships in well-padded box..
Thorndike Press. Large hardback in very good condition, gift inscription to fep otherwise very clean and bright. No dustwrapper as issued. Please allow 3-5 days for delivery within the UK, please contact me for international delivery times. No quibble refund if not entirely satisfied. Cardiff Books supports SCOPE: About Disability. . Very Good. Hardcover. 2013. New York: Henry Holt and Company, 2013. Book. As New. Hardcover. 1st Edition. First Edition/First Printing. Hardcover in dustjacket. 877 pages with index, photographs and map endpapers. 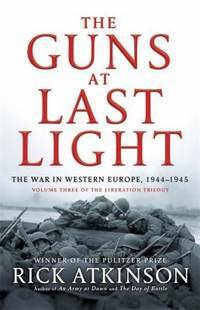 The magnificent conclusion to the author's acclaimed Liberation Trilogy about the Allied triumph in Europe during World War Two. Other than a touch of edgewear to the dustjacket, this is an As new copy. Unread. Not remainder. Not price clipped. From my smoke-free collection. Ships in well-padded box..
Henry Holt and Co.. Hardcover. 0805062904 New Condition. . New. Picador. Paperback. 1250037816 Please allow 4 - 14 business days for Standard shipping, within the US. Thank you for supporting our small, family-owned business! . Fine. 2014-05-13. Volume Three of The. Thorndike Press. Hardcover. 1410458970 Like New Condition. . Fine. Henry Holt and Co.. Hardcover. 0805062904 Please allow 4 - 14 business days for Standard shipping, within the US. Thank you for supporting our small, family-owned business! . Fine. 2013-05-14. Volume Three of The. Henry Holt and Co.. Hardcover. 0805062904 Please allow 4 - 14 business days for Standard shipping, within the US. Thank you for supporting our small, family-owned business! . New. 2013-05-14. Volume Three of The. New York: Henry Holt, 2002. 1st. Hardcover. Fine/fine. Bound in the publisher's original quarter cloth and paper over boards, spine and cover stamped in gilt. Volume III of the Liberation Trilogy. 2013-05-14. Good. Ships with Tracking Number! INTERNATIONAL WORLDWIDE Shipping available. May not contain Access Codes or Supplements. May be ex-library. Shipping & Handling by region. Buy with confidence, excellent customer service! US: Henry Holt and Co., 2013. Hardcover. Near Fine/Near Fine. 6.5 x 48.4 x 244.6 inches. Signed. Signed by author on title page. Pages are clean, no additional markings from previous owners. Boards are clean. Binding is square and tight. Faint wear to cloth at spine ends and corners. Text block is clean. Dust jacket is clean, bright, and unmarked with slight edgewear. PICTURES PROVIDED UPON REQUEST. Picador. Paperback. 1250037816 Please allow 4 - 14 business days for Standard shipping, within the US. Thank you for supporting our small, family-owned business! . Fair. 2014-05-13. Volume Three of The. Henry Holt and Co.. Hardcover. 0805062904 Like New Condition. . Fine. Picador. PAPERBACK. 1250037816 Remainder mark . Fine. Henry Holt and Co.. Hardcover. 0805062904 Please allow 4 - 14 business days for Standard shipping, within the US. Thank you for supporting our small, family-owned business! . Fair. 2013-05-14. Volume Three of The. US: Henry Holt and Co., 2013. Henry Holt and Co. 2013 First Edition NL with 1 Very Good/Very Good DJ Light wear to boards, solid structure, map illustrated end papers, bright photo illustrated pages. Bright jacket with minimal edgewear and tiny mended tears. LARGE ITEM.. First Edition NL with 1. Hardcover. Very Good/Very Good DJ. Picador. PAPERBACK. 1250037816 Minor shelf wear . Very Good. Henry Holt and Co.. Hardcover. 0805062904 *LIKE NEW* Ships Same Day or Next! . Fine. Henry Holt and Co.. Hardcover. 0805062904 *BRAND NEW* Ships Same Day or Next! . New. Picador. PAPERBACK. 1250037816 Special order direct from the distributor . New.